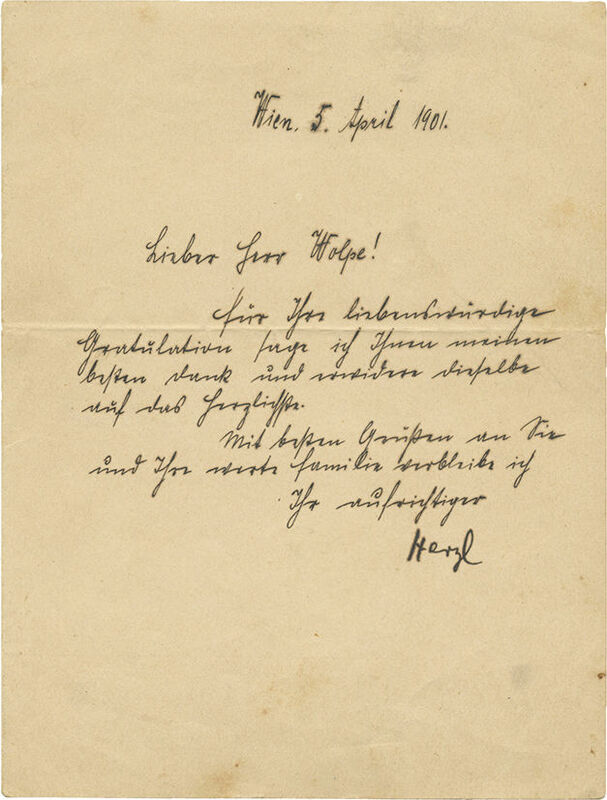 An autograph letter, hand-signed by Theodor Herzl. Vienna, 1901. German. The letter, dated 5.4.1901, is addressed to a person named Wolpe: "Dear Mr. Wolpe, thank you for your kind wishes, and reciprocate them most cordially. Best regards to you and your family". Signed: "Herzl". This letter was written between the fourth and fifth Zionist congresses, held in London in 1900 and 1901. The congresses were held in London with the intention of influencing the English public opinion and government and lead them to support the Zionist enterprise. During these congresses it was decided, among other things, to found JNF, to institute regulations for the Zionist Organization and to start a competition for a national anthem. In addition, a public appeal to North African Jews was published and it was announced that the Ottoman Sultan supports the Jews. The recipient of this letter is, most probably, Jonas Wolpe, a Zionist activist and a merchant, who was one of the delegates to the fourth Zionist Congress. leaf (folded in half, written widthwise on half a page), approx. 17.5 cm. Stains. Creases and minor blemishes. Folding marks. Some tears along the folding marks, by the margins. Small hole where folding marks meet.